Richard Brooks Obituary - HARRISON, Michigan | Stocking Funeral Home, Inc.
Obituary for Richard William Brooks Sr.
Richard William Brooks Sr. 82 of rural Harrison passed away at his home on May 4, 2018. 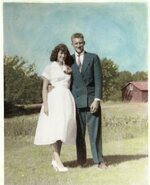 Richard was born the son of Floyd L. and Hilda (Miller) Brooks on May 6, 1935 in Harrison at his family’s farm. Richard was a life time resident and farmer of Harrison. Mr. Brooks was united in marriage to Ms. Jonila “Joan” M. Calkins on July 24, 1955 in Harrison. Richard was a forty-five year member of Local 324, as a heavy equipment mechanic. Richard enjoyed farming, watching old western movies and spoiling his grandchildren. Surviving Mr. Brooks is his wife of sixty-two years, Mrs. Joan M. Brooks of Harrison, two daughters; Joanne Lynch and husband Tom of Estero, Florida and Diane J. Ehle and husband Bob of Harrison, two sons; Richard W. Brooks Jr. and wife Colleen of Richmond, Virginia and David Brooks and wife Annie of Harrison, eleven grandchildren, twenty one great-grandchildren, one great great-grandchild, two brothers; John Brooks and wife Betty of Harrison and Elwood Brooks and wife Ruth also of Harrison, many nieces, nephews, two beloved dogs; Heidi and Minnie, and twelve barn cats. Mr. Brooks was preceded in death by his parents, two sisters; Rosemary Brooks and Janet Moyer and one brother, William Brooks. Celebration of life services honoring Mr. Brooks will take place on Thursday, May 10, 2018 at 11:00 a.m. from Stocking Funeral Home, Harrison with Elder Joyce Beemer officiating. Family and friends are invited to share memories and stories on Wednesday, May 9, 2018 from 6:00 – 8:00 p.m. and Thursday, May 10, 2018 from 9:30 a.m. until time of services. Memorial gifts in memory of Richard may be considered to the Brooks family, in care of Mrs. Joan M. Brooks. To share an online memory or condolence with Richard’s family, please visit: www.stockingfuneralhome.com. Arrangements for Mr. Brooks are entrusted with Stocking Funeral Home, Harrison (989) 539-7810. To send flowers to the family of Richard William Brooks Sr., please visit our Heartfelt Sympathies Store.